Neither the earlier nor the later grasses so monopolize field and wayside as do those of this genus, whose hundred species are scattered through all the temperate regions of the world. As typical of midsummer warmth as goldenrod is of the largesse of autumn, they begin to bloom by the waysides of June, and symbolize, as do no other plants, the heat of summer with its hay fields and the endless, iterant call of the cicada. In drier places Brown Bent-grass (Agrostis canina) is often found in bloom a month before the common Red-top, and it is also frequently seen in moister meadows as a red-brown mist closery following the blossoming of Velvet Grass. In bloom the plant calls to mind a miniature Red-top, but the leaves are narrower than those of the latter species, the basal leaves being almost bristle-form, while the flowering scale differs in developing a dorsal awn. Brown Bent is often seen on lawns and it is also quite common near the coastwise marshes of New England and New Jersey, where under the hot sunlight the widely open panicles of this grass rarely vary in colour from brown or brownish purple, flecked with white by the small anthers. Thin-grass (Agrostis perennans) is well described by its common name. The panicles are very pale green, rarely tinged with purple, and the short branches, with the branchlets and pedicels, are widely spreading. The whole plant is weak and slender, and the tiny flowers, opening soon after Brown Bent blossoms, are in outward appearance not unlike those of a small Red-top that has lost its colour through growing in a shaded place, but in examining a blossom with the microscope the palet is seen to be minute or lacking. Thin-grass is most frequently found in the damp soil of shaded pastures, and it is one of the comparatively few grasses that ascend the highest mountains of the Appalachians. cate panicles which glisten in the sunlight like purple cobwebs. When the Fescues are past, and the Redtop is in its glory of midsummer colouring, the slender stems of this grass droop by the wayside and may be passed a score of times unnoticed, for, although the flowering-heads are often a foot and a half long and half as broad, the widely spreading branches are so infinitely fine that the panicles seem to have gathered "fern-seed," since they so nearly "walk invisible." To see the plant in its greatest beauty one should seek an upland plain where the landscape gardening of Nature has planted the dark green of bush-clover and tick-trefoil against the summer grasses. 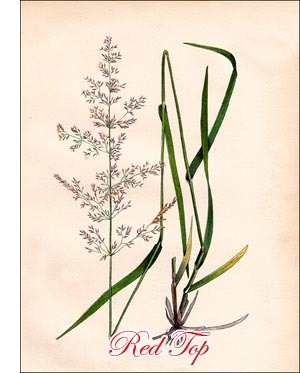 Here, where the Wild Oat-grass was earlier abundant, and where later the Beardgrasses will endure throughout the autumn, are large tufts of Rough Hair-grass - the whole flowering - head, stem, branch, and spikelet, burned to rosepurple by the July sun. Before the panicles expand they are sometimes gathered and sold as "Silk-grass," but the name of Fly-away Grass is more appropriate as the seeds ripen, for the light panicles are soon broken by the wind and drift over the fields as the earliest tumble-weed. The Red-top and its varieties are among the chief grasses of July fields, and in midsummer acre upon acre is clothed by them in varying tones of reddish purple. Perhaps native in the North and Northwest, Red-top was brought to the Eastern States from Europe in the eighteenth century and was cultivated as " English Grass," but its various uses and appearances under many conditions of soil and climate have given it a multitude of names. As Bonnet-grass it was common along the valley of the Connecticut River, where the stems were formerly cut to be braided into hats. As Fioren a variety which produces a smooth and velvet-like turf was most highly extolled in England and Ireland as a winter fodder grass, and its sponsor was at one time caricatured as mowing grass in winter while snow lay upon the ground. The most common form of Red-top is found in nearly all the states, and as in early summer the unopened panicles, in narrow spikes of green or purple, rise above the leaves the grass may be recognized several weeks before it is in bloom. Where the earth is moist the blossoms are darker in colour, and in the more luxuriant growth of rich soil rootstocks are formed, which in gardens are as difficult to eradicate as are those of the too-common Couch-grass.